It’s easy to relax and enjoy the peaceful lake scenery in Scandic Aulanko Spa. In addition to different pools and saunas, you can enjoy the pampering treatments at the Day spa. Our luxurious spa facilities offer a refreshing break from everyday life. You can also enjoy drinks at the spa – pool bar Lähde serves customers. Use of the spa is included for hotel guests. Please note! The pool area closes 30 min before the spa closes. The pool area has a 25-metre long exercise pool, a multipurpose pool with hot tubs and hydromassage points, jacuzzi, hot water lagoon, cold water pools, water slide, outdoor pool and a pool suitable for small children. The average total chlorine content of the pool water in all pools is approx. 0.6 mg/1 l water. The spa area has 7 saunas; a salt sauna, a traditional sauna and a steam sauna on the women’s side and a wilderness sauna, a traditional sauna and a steam sauna on the men’s side. 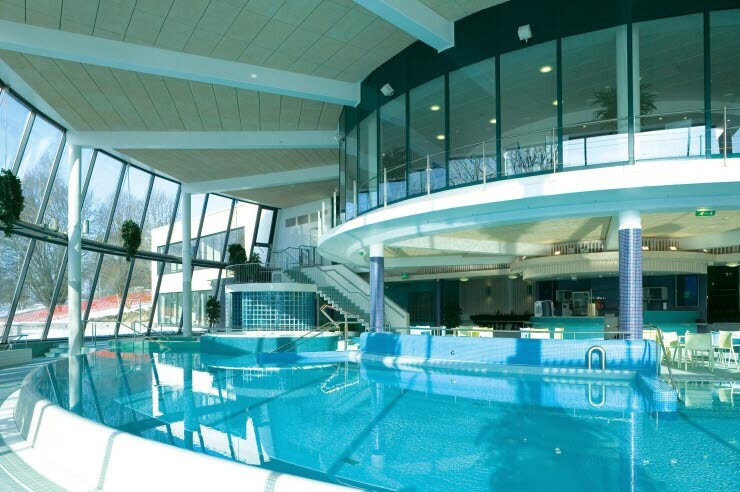 In addition to the pool facilities, the spa complex has a high-quality Day spa, cafe-restaurant Karlberg, a VIP sauna equipped with a cabinet, a 6-lane glow-bowling alley, a gym and a multipurpose sports hall, Aulanko Areena.